I appreciated the list of recommended nutrients with dosing and mechanism of action. Liked that she shared her personal story and her triumph over endometriosis as well as the comparison between conventional and naturopathic treatments. She's an excellent presenter! Clear and concise. Great content. Basic naturopathic treatments open to a wide range of practices. I enjoyed hearing how the PCOS patient did not have a standard look. The naturopathic therapies were clear. Dr. Frank reviewed the endocrinology of PCOS from a clinical, ND perspective which is pure gold. Expanded my view on what PCOS may "look" like. Presenter was well-informed on this topic and had a generous amount of information. Step by step procedure outline-- I found the information very helpful. The clarity with which the presentation was given and the pictures of the escharotic treatment/ process was very educational. Loved the variation on protocols and the updated information. Addressed 2 issues I had not seen addressed before: HPV without ASCUS and diagnosis and treatment in men, both of which recently came up in my practice. I liked that she shared the physician letter that is sent out when taking on a patient for treatment. Wow. I loved the case presentation of escharotics that included photo documentation of the cervices. Invaluable. Presentation Description: Endometriosis affects at least 6.3 million women and girls in the U.S. Endometriosis is caused by dysregulation of the immune and endocrine systems and can create infertility, pain and suffering for these women. Women with endometriosis are seeking alternative options, and naturopathic doctors are poised to provide them with better answers. Through recent research the underlying causes of endometriosis are becoming clearer. A caring and knowledgeable doctor, along with a comprehensive approach to evidence-based treatment, will have the best chance at helping these women manage their condition successfully. Case studies and sample treatment plans will be provided. Gain compassion for women with endometriosis and a deeper understanding of the patient’s experience. Understand that endometriosis is a whole body disease and not merely a gynecological disorder because it involves the immune, endocrine, gastrointestinal and detoxification systems. Create comprehensive naturopathic treatment plans that include diet, lifestyle modifications, pelvic physical therapy, evidence-based botanical medicine, acupuncture, nutritional supplements and more. Understand the prescription of medications for endometriosis and review new drugs in development. 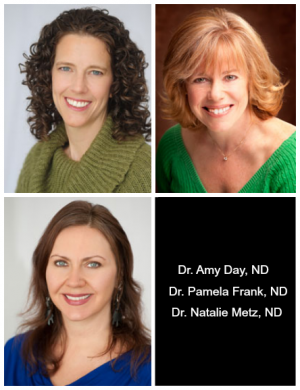 Dr. Amy Day, ND received her Doctorate of Naturopathic Medicine from the National College of Naturopathic Medicine (NCNM) in Portland, OR and was among the first NDs licensed in California. After eight years at San Francisco Natural Medicine, Dr. Amy opened her private practice in Berkeley in 2012, specializing in helping busy professional women with stress, fatigue and hormonal issues. She is known throughout the Bay Area as a top women’s health expert, and is an author and speaker for both health care providers and the public. She is a past board member of the California Naturopathic Doctors Association and currently serves on the Board of Directors for the Endometriosis Association. In 2001, during medical school, Dr. Amy was diagnosed with endometriosis and committed herself to learning everything she could about this poorly understood condition. Today, she is passionate about bringing a holistic perspective to doctors who treat women with endometrosis, and broadening the treatment options available to the millions of women worldwide who struggle with this complicated disease. Learn more and connect with Dr. Amy by visiting www.DrAmyDay.com. Presentation Description: Clinicians will learn how to recognize the signs and symptoms of PCOS, order and interpret the correct diagnostic tests, understand current conventional treatments and implement effective evidence-based naturopathic treatment protocols, including dietary approaches, lifestyle counseling, botanical medicine, and nutritional supplements. Understand signs and symptoms of PCOS. Order and interpret appropriate diagnostic tests to confirm PCOS. Understand current conventional treatments for PCOS. Implement and prescribe evidence-based therapeutic diets, lifestyle modifications, botanical medicine, and nutritional supplements to treat PCOS. Glean clinical pearls to improve fertility in patients with PCOS. Presentation Description: HPV (human papilloma virus) is the most common sexually transmitted infection and is contracted by at least half of all sexually active men and women at some point in their lives. Abnormal Pap test results occur in approximately 3 million women in the U.S. each year, and are commonly associated with HPV infection. This presentation will review naturopathic management of cervical dysplasia and HPV, combining systemic and local treatments, including cervical escharotics. Join us for an up-to-date discussion of evaluation of cervical dysplasia and HPV infection and learn to develop evidence-based treatment plans for management of HPV infection and cervical dysplasia, including appropriate referral for further follow up. Have an understanding of the epidemiology of HPV infection and cervical dysplasia. Have an understanding of conventional allopathic management of cervical dysplasia. Understand how to diagnose HPV infection in men and women. Create evidence-based naturopathic prescriptions for treating HPV positive men. Understand how to develop evidence-based treatment plans for management of HPV infection and cervical dysplasia, including appropriate referral for further follow-up, as well as indications and contraindications for treatment. Understand to how perform cervical escharotic treatments in the office, how to track progression of treatments and manage follow-up care. Natalie Metz, ND is in practice in San Francisco, with a focus on Women's Health, Botanical Medicine and Digestive Wellness. A very large part of her practice is the natural management of cervical dysplasia, with an expanding interest in treating men with HPV. During medical school she pursued additional training in herbalism, midwifery, and naturopathic philosophy. She helped found the Naturopathic Gathering, an annual philosophy conference, and taught within the botanical medicine NPLEX review curricula. She received her Bachelor's degree in chemistry and has a background as a medicinal chemist, designing novel pharmaceutical agents. She serves as faculty for several educational institutions, is featured in the documentaryThe Future of Medicine, and is a contributing author for the Foundations of Naturopathic Medicine textbook. She recently completed graduate studies at the California Institute of Integral Studies in the Philosophy, Cosmology, and Consciousness program. She is a lifelong student and lover of art, dance and music and enjoys sharing her passion for life with the world. For more information about her practice, please visit www.naturecaresdoc.com.